This IP-60 Photo Album from Pioneer Photo Albums is a 30-page album designed to store and display up to 60 photos. Each page holds one 4 x 6" photo per side in vertical orientation. The cover is a hard plastic that comes in a transparent red color. Each page is a clear top-loading pocket. Both album and pages are photo-safe, archival, and acid-free. 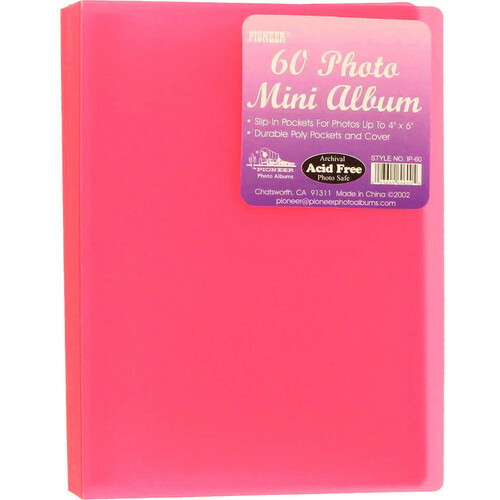 Box Dimensions (LxWxH) 6.45 x 4.95 x 0.7"
Transparent Poly Photo Album - 4 x 6" (Transparent Red) is rated 5.0 out of 5 by 2. Rated 5 out of 5 by Jules from Perfect for my purpose This was exactly what I wanted and needed. The album is slim and lightweight, with large 4x6 pockets. It held 60 photos and maybe one or two more. I was making a small album to leave out at a memorial for people to flip through. It would not withstand kids pulling and tugging, but is perfect for adults to peruse. Rated 5 out of 5 by Valerie from Transparent Poly Photo Album in beautiful colors Beautiful color and east of photo placements. Wonderful price.